I can shoot 100yd targets with irons just fine. Not spectacular, sure, but fine. With a good target peep sight 100yds is fine with irons. I can hold 2.5” groups with M1 Carbine sights for cripes sake! 12x scope at 1200yds is the equivalent of the MkI eyeball with crosshairs at 100yds. Sure, if I was going to shoot that far I’d rather something like a 24-30x sight. Or higher, but a 12x max would be okay. I prefer at least 2x per 100yds, but I am fine with 1x per 100. You can only hit as well as you can see... A variable scope with a maximum magnification of about 25x is usually GTG for most practical distances though. Adding magnification at extended ranges can add problems. First thiing is that as we add magnification, we place greater demands on the scope's optical system and quality issue become more apparent. One thing you'll notice is that at long range. it is often easier to see with a n inexpensive scope if we dial back on the magnification. I often see this in low to mid-range scopes, and as one dials up, internal dispersion and lens aberrations become quite noticeable, especially on a bright day. Nest thing is that when we dial up magnification to make the target bigger, everything between you and the target is also bigger and easier to see, like haze, mist, dust, rain, snow and especially mirage. Mirage is much easier to see at higher magnifications and at longer ranges on tough days, we'd often dial down to improve target visibility. ETA: They also use rifles with aperture sights at 1,000 yards, but the bullseye is about 6 feet in diameter. More magnification doesn't mean better results, and it can make you miss. In the long range course I took, the instructor regular told students to dial back their high magnification scopes, and they has much better results. I'm probably switching to 4-6x max for my AR's, and keeping my 12x fixed power for the bolt action. I started to change my mind on things after my first 18""SPR" build. It's just too big and cumbersome that I know I would never use it at short ranges. But I guess that's why it's a SPR (special purpose rifle) right? It's main objective is the special purpose of long range shooting. But that got me thinking, isn't my bolt action the real SPR? If I knew I was going to be shooting far, why wouldn't I take the better caliber for that purpose instead of .223? On the contrary, if it was a SHTF rifle, why wouldn't I use a rifle that was capable from close quarters all the way out to 600+? Since then I decided that the only long barrels I want are on rifles I only intend to shoot ONLY long range with. For AR-15's, I hate having a long barrel that prohibits what I can do up close, especially after seeing what scoped SBR's can do at 600 or 700 yards. The same goes for optics. I've seen that a 1-4x scope can do just fine at extended ranges, and I doubt want my AR to suffer at shooting up close. It's all a matter of what your purposes are. I like 20in AR just fine ( with A2 profile ). With HBAR , the weight/ balance becomes the issue more than the length per se . A question if I might, thinking of abnormalities seen in a scope at or near max magnification (mid $ range), would a 24x optic @ 12x have less chance of showing these abnormalities than a 12x optic @ max magnification? and now I wonder if the extra weight from more glass help precision? Just a thought. IMO, the issues grow with absolute magnification. Given scopes of equal quality in your example, I would expect them to look about the same at the same magnification, but as you increase the 24x optic beyond 12x, the image quality would degrade. Because it is the absolute magnification that brings the optical errors out, you will see more issues at higher magnifications regardless of the scopes magnification ceiling. A very easy example of this is the SuperSniper fixed magnification models in 12x, 16x and 20x. I applaud SWFA for making these inexpensive, but functional scopes available and "for the money", these are decent scopes. Although the image quality cannot compare to scopes costing twice as much, they do a very good job for an entry level scope or casual shooter. Using the 12x scope, one does not notice the very slight haziness and the inability to get a perfectly sharp focus and the scope is fine. The 16x makes the image larger, but not a lot sharper and the small amount of internal haziness is a little more obvious, and it gets harder to hit the sweet spot where focus is optimum. With the 20x model, the haze is still a little more pronounced, but it seems like you can never get the focus perfect like you can (like it seemed to be) with the 12x. Objects are bigger, but not much easier to see, and the internal dispersion begins to become distracting. Your eye tires quickly as it works to improve the image. A variable in the same price range would allow you to dial through those differences and you would likely end up using it at a lower magnification setting. Next time you go to a gun show or a store, someplace where you can handle the various scopes, grab an inexpensive variable and run it through its settings while looking carefully at distant objects. Look at overall image quality, distortion at the edges, color (chromatic) distortion and haze (dispersion). The only problem with indoor evaluation is that the internal dispersion is somewhat concealed by the reduction in ambient light, but one can still watch the image quality change. My inexpensive Celestron 16-48x65 ED spotting scope is the same way. Great image at 16x, but at 48x you don't even want to look through it, and you almost can't. I never dialed it up beyond about 20x for my daily use, but the first thing a new shooter would do is crank it up to 48x and struggle with the focus. When you show them the issue, they slowly work their way back down to lower magnification for easier viewing, eventually ending up at 20-24x. By comparison, my Leupold 12-40x spotter looks pretty good throughout the magnification range and if mirage isn't bad, I often use it at around 25-30x. About the only time I ever use it at 40x is when I occasionally and momentarily dial it up at 100 yards to see if that is one bullet hole or two. Sometimes, I can dial it up to 40x at 1,000 yards or further, but the image quality will fall off during ordinary mirage conditions and I can usually see better at lower magnifications. There is also the field of view consideration and with greater magnification, we lose some of our field of view. If one is trying to watch wind indicators, it is often better to keep magnification relatively low. At those high magnifications you also see your own heartbeat in the scope and it really can be difficult to time the shot right. Either way, it's just not necessary. 12x is plenty fine for long ranges. Even 4x can do an okay job. 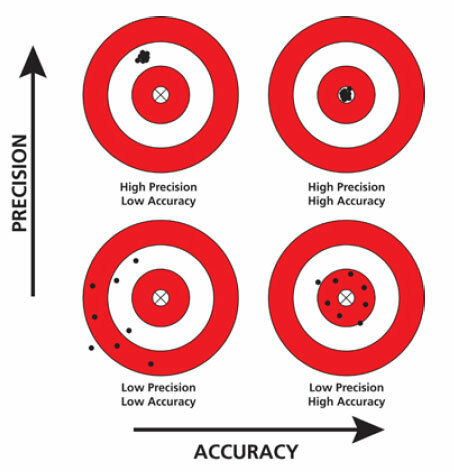 If you have enough magnification to slice your target into quarters with the crosshairs, you can make hits. I might be biased though, as my goals are to hit a steel target at long ranges, not shoot the testicles off a horse fly. I really don't care what my group size is as long as it's a hit. I shot a course at Bang Steel and everyone that got told to turn their magnification down ended up shooting much better. For the record, I like the Super Sniper SWFA 12x scope Mr. Shell mentioned. For the same price, a fixed power scope has better quality than a variable. It is not just purpose, but it is your frakenand what is comfortable for you. I am 6’1” and a bit over 190. Mostly muscle. I am no 7’2” 300lbs body builder that makes an M16A3 look like a squirt gun...but I do notice I tend to be comfortable with rifles a little bigger/a little heavier than a number of my...umm...less vertically gifted brethren are. I’ve taken my 20” AR-15 hunting and it is just fine. A little heavy (9lbs even with scope, but a lot is in that HBAR barrel), but the length is okay. My 18” 6.5 grendel is better balanced and a little easier to manuever (I have it down to 8lbs 1oz IIRC, also an HBAR, but fluted, 2” shorter and it uses a GWACS lower). The weight difference I notice more than anything. I have a 16” .223 AR-15 (that one is 6lbs13oz with red dot. About 7lb8oz with magnifier on it. Once I get my other GWACS lower built and a nicer fluted 16” HBAR Barrel on there I suspect I can get it down to about 6lbs5-8oz along with a couple of other things I have planned). If SHTF or someone was coming through the door, that would be my go to. However I find I like 18” and 20” more for range and field usage. I rarely use hearing protection when deer hunting. So reduced muzzle blast (my 6.5 grendel and 20” .223 wear linear comps to reduce it and it is very noticeable difference!) is a good thing. The extra stability is good. I doubt any deer will notice the extra muzzle velocity and my hunting distances are short enough I am well within the maximum point blank range of the rifles, or even an SBR. So far I’ve shoot zero deer with my 20” .223 or 18” 6.5 grendel. I haven’t had them out hunting enough. But I’ve racked up at least a thousand paper kills with my 20” and a hundred or so with my 6.5 grendel and I do appreciate the extra muzzle velocity there. Hey whatever floats your boat. I just know I would never want to lug my 18" SPR style AR to a carbine course, CQC training, etc. It's not that heavy, it's just long. Maybe I should try a collapsible stock again. Additionally, I want to go to a 1-4x scope. Magnification really hinders close range shooting for me. The 18" is fine though, I just see people use shorter barrels with not much difference.